VISALIA - The Visalia Chamber of Commerce is now accepting nominations for its first annual Emerging Leaders of the Year Award. This award focuses on the contributions young professionals make to the local community through volunteerism and community activities, strides they are making to better themselves via professional development activities and their professional accomplishments. 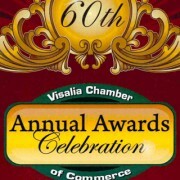 Nominations can be made by contacting the Chamber at 559-734-5876 or by downloading the form from the Chamber website: http://www.visaliachamber.org/pages/Events/. Nomination forms are due to the Chamber office by March 31, 2014. All nominees will then be sent a questionnaire to fill out in acceptance of their nomination. The winner will be announced at the 2014 Annual Awards banquet. The community is also encouraged to nominate businesses or individuals who have exemplified outstanding service and commitment to Visalia. Categories for the 2014 Annuals Awards include: Man of the Year, Woman of the Year and Small, Medium, Large, Agri-Business and Non-Profit of the year.